Nine Inches, Tom Perrotta's first true collection, features ten stories—some sharp and funny, some mordant and surprising, and a few intense and disturbing. 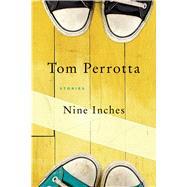 Whether he's dropping into the lives of two teachers—and their love lost and found—in "Nine Inches", documenting the unraveling of a dad at a Little League game in "The Smile on Happy Chang's Face", or gently marking the points of connection between an old woman and a benched high school football player in "Senior Season", Perrotta writes with a sure sense of his characters and their secret longings. Nine Inches contains an elegant collection of short fiction: stories that are as assured in their depictions of characters young and old, established and unsure, as any written today. TOM PERROTTA is the author of eight books, most recently The Leftovers. Two of his novels—Election and Little Children—have been made into acclaimed and award-winning movies. Perrotta grew up in New Jersey and now lives outside of Boston, Massachusetts.